At almost $4.2 million, Torment: Tides of Numernera has raked in more cash than any Kickstarter yet. The next development cycle seems to be in favor of the CRPG. After Double Fine showed the world that Kickstarter can fund games, everyone crawled out of their nostalgic caves to birth their game ideas. Wasteland's coming back, Shadowrun's getting a real RPG for once, and Obsidian's returning to their roots with Project Eternity. It was only a matter of time before someone cast 'Resurrect' on the most buxom of RPG darlings, Planescape: Torment. 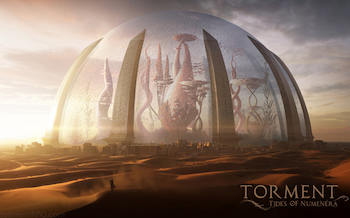 Within six hours, inXile Entertainment met their $900,000 funding goal. After a month, it's raised a staggering $4,188,927, beating Project Eternity previous record of$3,986,929, and making it the most-funded Kickstarter so far. Writing by DnD vet Monte Cook. A crafting system "that includes some puzzle-solving elements (though not what you'd call a mini-game) and that is tied into the world and narrative." Windows, Mac, and Linux releases. More characters, areas, and a much longer story. Legacy and Tide systems, which promise to enhance the consequences of choices and the reactivity of the world. Shedding its Dungeons and Dragon's license, Torment takes place in Numernera. Created by Monte Cook, Numernera comes from the same odd vein as the original Planescape setting. Essentially, it exists to break, shatter, and twist traditional fantasy RPG stereotypes. It also serves as a framework for an assortment of moral and philosophical quandaries. Headed by Interplay vet Brian Fargo, inXile is also making Wasteland 2 which is due out later this year. Even though the Kickstarter campaign has ended, you can still pre-order the game via the official website.